I have taught at three different public schools in the United States (two in California and one in Washington state), and now three different international schools (two in Thailand, one in Romania) - and at each school I have honed my practice as a chemistry teacher based on interactions and feedback from students, the strengths of the school, and the expertise of my colleagues. One of the strengths of my current school is the emphasis on student-driven research projects - labeled the Individual Research Project, or IRP. Within this framework, by the time students reach IB science courses in grade 11, they will have completed a minimum of four IRP's. Each IRP is a student-generated research question, followed by data collection and processing - and then concluding and evaluating. All of this ends up in a full lab report. But more important than the lab report is the student being part of the process of building new knowledge and doing science. There is no doubt that IRP's take a tremendous effort by the school. While my classes may be small (typically around 20-22 maximum), with my IB Chemistry classes quite full I will often have 30-50 individual investigations happening at one time. Each of these has a unique set of equipment and materials required. I'm not sure I could handle this workload without the help of a dedicated laboratory technician. And yes, I consider myself very lucky to have this luxury. But there is a certain energy in the room on IRP days, when each student is fully engaged in collecting data for an experiment of her/his own design. So what does it take to be published? The research doesn't need to be "ground-breaking" with a press release announcing a cure for cancer in order to get published. It is truly intended for entry-level research in a secondary school laboratory. The submissions guidelines and process are given below in Figure 2. The expectation isn't "…highly important contributions in the field." Rather, this is intended as an opportunity for students to be part of the process of science. And as a teacher, I was incredibly proud of the work of one of my students that used his IB Extended Essay as the basis for an ISJOS article about using butterfly pea as a pH indicator.1 Since I was his advisor, I wasn't part of the review process - but seeing his work published, especially as the first chemistry-related article in ISJOS, was definitely one of the highlights of my teaching career. Figure 3 - Results & Discussion from student research article. Do you have any students that are doing original, independent work that might be interested in publishing? If so, encourage them to check out ISJOS and start collecting that data! 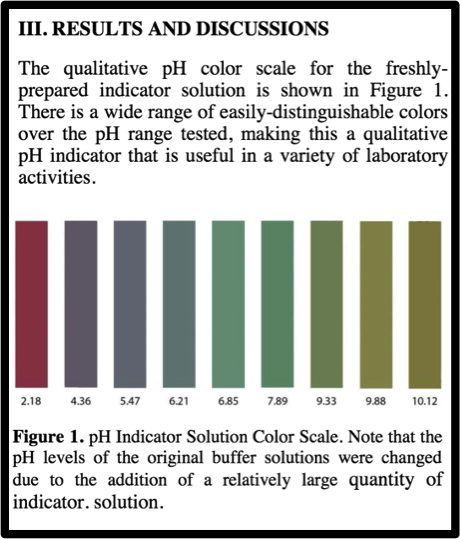 1Amaolo, Alessio, The Butterfly Pea Flower as a pH Indicator, International Scholastic Journal of Science 11 (1) Jan-Dec, 2017, www.isjos.org. **Full disclosure: The International Scholastic Journal of Science is the brainchild of a colleague of mine at my current international school in Bangkok. I am now a volunteer on the Editorial Board and help with the chemistry-focused articles that are submitted to ISJOS. My role with ISJOS is currently quite minimal, with some paper reviewing for chemistry-related papers happening a few times per year.